Governments have traditionally funded early stage energy technology research but find it difficult to support technologies through to commercial exploitation. Conversely, private investors are good at identifying the most promising companies and start-ups but are unable to assume both technological and commercial risks. What if a new approach could avoid these pitfalls by allowing the two sectors to complement each other? The new Breakthrough Energy Europe investment fund intends to do just that. 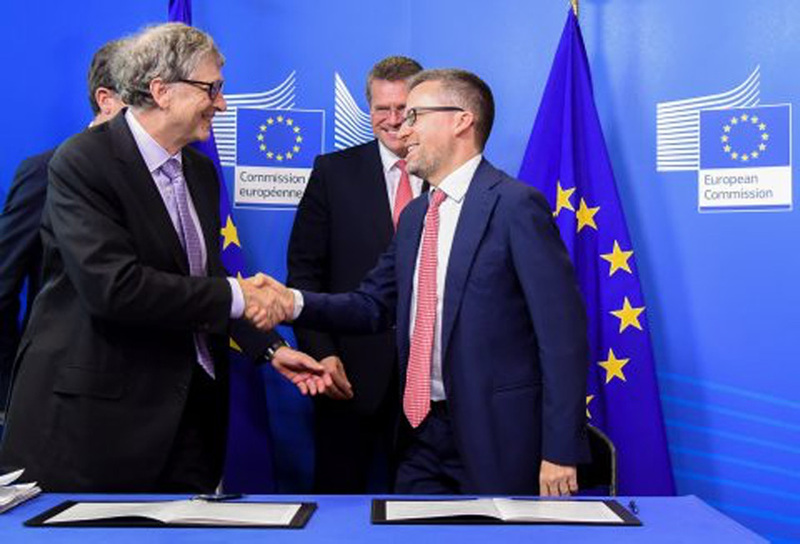 Increasing public-private cooperation is one of Mission Innovation’s (MI) goals and the objective of the €100M radical new joint investment fund announced by the European Commission and Bill Gates-led Breakthrough Energy last month. On the 17th October Carlos Moedas, Commissioner for Research, Science and Innovation, and Bill Gates, Chairman of Breakthrough Energy Venture, signed a Memorandum of Understanding to establish Breakthrough Energy Europe (BEE), a joint investment fund that will help innovative European companies develop and bring to market radically new clean energy technologies. Half of the €100 million equity will come from Breakthrough Energy (or its affiliates), and the other half from InnovFin – a financial instrument managed by the European Investment Bank and funded through Horizon 2020, the EU’s current research and innovation programme. Negotiations started during the One Planet Summit in Paris, in December 2017, when Breakthrough Energy announced the piloting of public-private partnerships with five Mission Innovation members, including the European Commission. Through this fund, based on an equity funding mechanism, the EU will offer guarantees to venture capitalists who are facing high risks by investing in ground-breaking technologies. The use of ‘patient’ capital means private investors are not expecting an immediate return from their initial investment but rather a long-term reward. Such co-investment funding mechanisms already exist but are rarely targeted at energy and have not been applied in Europe. The parties will jointly establish a governing body that will manage the fund, hire EU-based private sector investment professionals and set the investment strategy. BEE aims to be a pilot project that can serve as a role model for similar initiatives in other geographical areas. The latest IPCC Report makes an urgent call for unprecedented changes in our society to limit temperature increase. This new co-investment vehicle will be crucial in supporting low carbon technologies and accelerating decarbonisation. One of the criteria driving the investment decision will be emissions reduction. Funds will target innovations that have the potential to achieve at least half a gigaton of greenhouse gas reduction every year. Investment will focus on five areas, where emission reduction related to energy use is vital to combating climate change: Electricity, Transport, Agriculture, Manufacturing, and Buildings. BEE represents an example of the World Economic Forum’s Bold Ideas to accelerate sustainable energy innovation discussed at the 3rd Mission Innovation Ministerial in Malmö. One of the Bold Ideas is described in the Forum’s White Paper as a “proposal to establish public-private co-investment vehicles to support and finance deep-tech energy innovations, reduce risks and improve the effectiveness of available public and private funding.” As outlined in the MI Action Plan, MI is collaborating with the World Economic Forum to achieve our shared goals.